After making the vegan Wal-mart pizza and sharing it with my iPhone, I decided to make another simple video again. 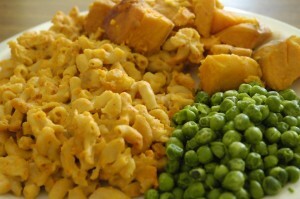 This time I wanted to show you how I basically make my vegan mac and cheese. 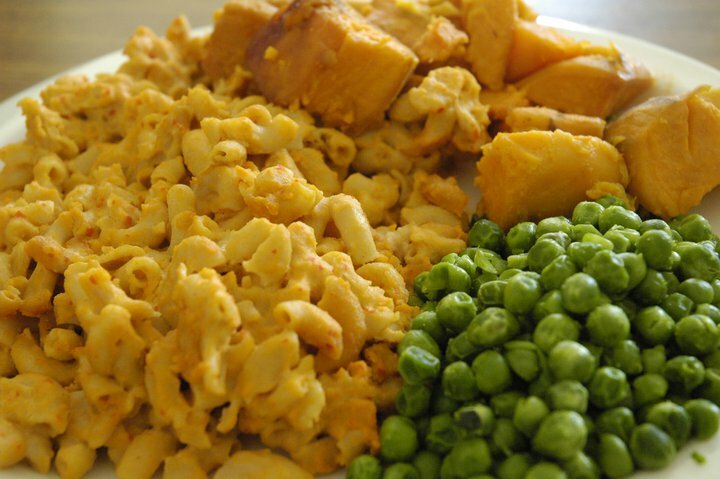 Just like the Wal-mart vegan cheese pizza recipe yesterday, you can make this vegan mac and cheese with ingredients SOLELY from your local grocery store!! 2. OpenSourceVegan.com’s Yeast Flake Free cashew cheese (I didn’t use the tahini, and I added 4 tsp. of cornstarch per recipe). I cooked the macaroni noodles in water and a little bit of water. I also cooked the cashew cheese and made sure I stirred it so it wouldn’t burn. Then I mixed the cheese and macaroni together. This is much faster than baking the cheese with the noodles, which is what I’ve traditionally done. The cornstarch does dilute the flavor slightly, but it sure does accelerate the cooking time. My Grandma and Cousin said they liked the macaroni, but they would reduce the salt a little. I added 2 tsp. of salt to the macaroni noodles, so I reduced the salt content in my recipe to 1 tsp. My Grandma said that the cashew cheese tasted like real macaroni and cheese.